Amid all the excitement and fun of Homecoming and Spirit Week, our Middle School students were tasked with creating a Homecoming T-Shirt that met certain criteria. In each Middle School advisory, students set out to meet the guidelines. 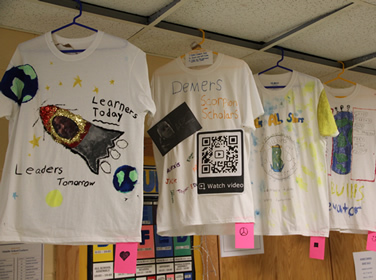 The theme for the shirts was this year's Middle School theme of "Learners Today, Leaders Tomorrow"— the motto that inspired the beautiful mosaic that Middle School students designed and created last spring with visiting mural artist Arturo Ho. The students were also asked to incorporate a clever name for their team's shirt, and additionally to include every advisory student's name and the name of their advisor into the design as well. Our students took on the challenge with enthusiasm and tremendous creativity! The shirts are on display in South Hall, and voting is underway to choose the favorite T-shirt for 6th, 7th, and 8th grades. The winners will be announced in early November—check back for an update!